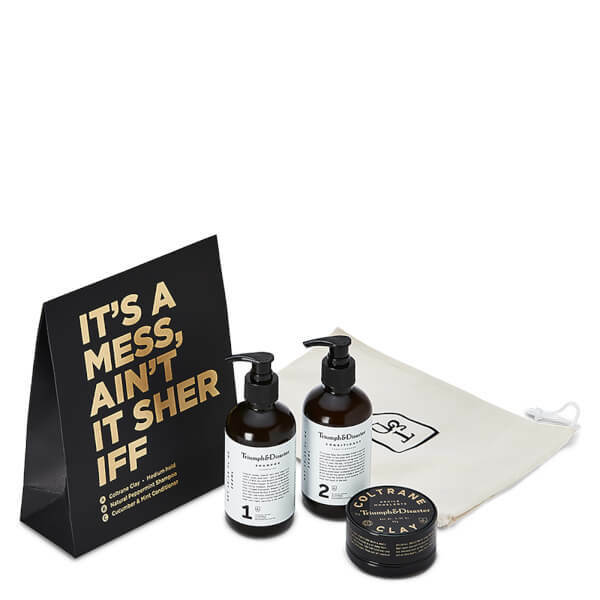 Triumph & Disaster It's a Mess Ain't It Sheriff Set combines a natural shampoo, a detangling Conditioner and the brand's magnificent hair clay. Complete with a drawstring bag. Infused with a fresh Peppermint fragrance, the gently foaming formula expertly lifts away dirt, excess oil and residual hair products; its blend of Hydrolysed Keratin and Argan oil work in tandem to protect, heal and strengthen damaged hair. Keratin rich to promote volume and structure, the shampoo will leave your hair feeling revitalised with improved hydration and health. 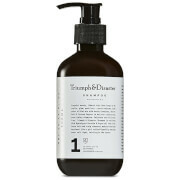 A 100% naturally derived daily conditioner that works to expertly nourish, detangle and de-stress your hair. Infused with a fresh Cucumber and Mint fragrance, the hydrating formula blends with Hydrolysed Keratin with Argan oil and soothing Tazmen Pepper to treat, heal and strengthen damaged hair. Keratin rich to add volume, structure and shine, the conditioner will leave your hair feeling healthy and replenished. A medium hold hair styling clay with a long-lasting matte finish. Formulated with White Clay, Beeswax and Pracaxi Oil, the styling formula expertly holds hair in place with a flexible feel; its conditioning blend adds shine whilst delivering natural protection from the environment. Flexible enough to re-mould, but hardy enough to stay put when you need it to. Expect professionally styled, perfectly preened hair. Infused with an all natural fragrance of American Tobacco. Champú: Aplicar sobre el cabello mojado, masajear y aclarar con agua. Acondicionador: Aplicar sobre el cabello tras el champú. Aclarar con abundante agua. Arcilla: Frotar una pequeña cantidad en las manos y aplicar sobre el cabello húmedo o seco. Shampoo: Aqua (Water), Coco-Glucoside, Glyceryl Oleate, Cocamidopropyl Betaine, Acacia Concinna Fruit Extract, Balanites Aegyptiaca (Desert Date) Fruit Extract, Gypsophila Paniculata Root Extract, Decyl Glucoside, Caprylyl/Capryl Glucoside, Hydroxyethycellolose, Sodium Cocoyl Apple Amino Acid, Gluconolactone, Sodium Benzoate, Tasmannia Lanceolata Fruit (Tazmen Pepper) Extract, Mentha Piperita (Peppermint) Oil, Hydrolysed Keratin, Argania Spinosa (Argan) Oil, Guar Hydroxypropyltrimonium Chloride, Sodium Citrate, Copper Chlorophyllin. Conditioner: Aqua (Water), Behentrimonium Methosulphate, Cetearyl Alcohol, Cetyl Alcohol, Glycerine, Dehydroacetic Acid, Benzyl Alcohol, Tasmannia Lanceolata Fruit (Tazmen Pepper) Extract, Guar Hydroxypropyltrimonium Chloride, Hydrolysed Keratin, Natural Fragrance, Argania Spinosa (Argan) Oil, Phospholipids & Helianthus Annuus (Sunflower) Seed Oil, † Amyl Cinnamal, † Hydroxycitronellal, † d-Limonene, † Benzyl Salicylate. †Component of Natural Fragrance. Clay: Aqua (Water), Kaolin (Clay), Cera Alba (Beeswax), Vegetable Petrolatum, Coco-Caprylate, Stearyl Alcohol, Copernicia Cerifera (Carnauba) Wax, Polyester 5, PEG 29 Castor Oil, Pongamia Pinnata Seed Oil, Pentaclethra Macroloba (Pracaxi) Seed Oil, Polysorbate 60 (Caster Derived), Natural Fragrance, CI 77499 (Black Oxide), †Linalool, †Eugenol, †Citronellol, †d-Limonene. †Component of Natural Fragrance.